"...The Comrades' production, directed by Arianna Soloway, strikes the ideal balance between ordinary and uncanny that this play requires. Cydney Moody is delicately sympathetic as Jean in a grown-up Wonderland. Caroline Latta is batty and outsize as Gordon's mother, Lynette Li a loose cannon of a wound-up woman as Hermia, Gordon's wife. Bryan Breau makes the most of his momentary manifestation as Gordon. And the cell-phone ballet of Ruhl's script is indicated throughout, the familiar transition of transmission made strangely wonderful." "...And Ruhl�s language? It�s rarely connected to the cast�s emotional life. Instead, it�s burdened with subtext, a little too grave to be anything else. The big exception is Breau�s fantastically skeezy Gordon. But he�s dead for the first half of the show. By the second, we�ve already understood that these characters are serious people with serious issues. When we look harder past that we see the artistic thinness at the heart of this show." "...Jean continues to answer more phone calls from relatives and business associates. She soon becomes enmeshed in the family and its affairs, and what we learn are Gordon's unseemly business dealings. That set-up was enough to make me see this play for a second time - I had been so thrilled by Steppenwolf's 2008 production that I bought the script and rave about the play - it has also made me a fan of Ruhl, a Macarthur Genius and Yale drama professor." 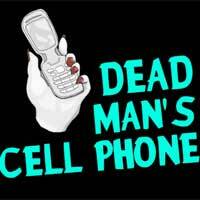 "...Dead Man's Cell Phone runs 90 minutes with no intermission and you will not be checking your phone (or watch if you're old school) to see if it's almost over. Soloway's actors are all notable, and performances by Moody and Latta are particularly strong. Latta is adorably gloomy as the fur- and velvet-wearing Mrs. Gottlieb and Moody is simply believable as the lonely woman whose life is rejuvenated by a stranger's cell phone." "...This is an absurd tongue-in-cheek noir-style, dark comedic drama directed by Arianna Soloway. It features the winsome, inquisitive and inventive Cydney Moody as "plain Jane" Jean who is perhaps being a bit voyeuristic but also just wants to make people feel better. In the process, she finds herself more involved than she probably expected." "...The actors (who also include Lynette Li, Mike Newquist and Valeria Rosero) are good, but too many opportunities are missed. A play about the ways in which we distance ourselves from each other need not feel distant, but more often than not that's how I felt. Like a cell phone that drops a call, too much here seems to fall into empty space."